Your digital identity is comprised of information that you volunteer about yourself and information that is observed about you as you simply participate in life. You can (somewhat) control the personal data that you share with others, but have you ever wondered about the type of information that is gathered about you, how long it is retained, and how it is used? A friend of mine introduced me to a video that provides insight into these questions. It contains an interesting perspective on how your digital identity is comprised, collected and used. It is interesting to note that almost four years of our lives is owned by someone else – and we willingly give it away. Does that make us indentured servants to those vendors who provide us “free services” in return? The global Internet becomes the personal Internet and information ceases to be information at all. I am not entirely sure that I agree with that statement; I guess it depends on who it is being made about. Unless we (the ones who generate the data) benefit in the form of better applications, streamlined experiences, or potentially even financial returns, then I don’t see it becoming a “personal Internet” at all. In our current form of indentured servitude, we continue to give away pieces of our freedom in return for very little. It is time to turn the model around. How Well Do Your Vendors Really Know You? How well do our vendors know us? I mean, how well do they really know us? And how much do they care? They collect countless data points about us through direct or indirect activity. They spend a lot of money buying lists containing all sorts of information about “people like us”, but what are they actually doing with all that information? Are they using it to create products geared towards our needs? Are they using it to make our shopping experience any better? Are they using it to make us feel special? Are they even using it at all? Based on one experience, It seems like some companies (some big name companies) just aren’t getting it. You might consider me a coffee fanatic – the stronger and the hotter the better. I will wake up first thing in the morning and make a 12 cup pot of Cuban coffee (one of my favorites) with the intention of drinking every last drop. 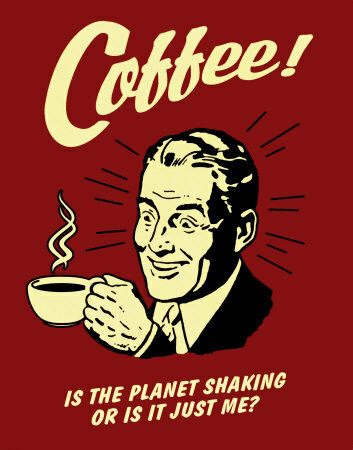 But, as with the best laid schemes of mice and men, I typically throw some of that coffee away (I know, sacrilegious). So, when a few years back vendors started producing one cup coffee makers with the pods, I figured what the heck, it is still cheaper and easier than Starbucks. So I figured I would make the switch; but which one? I researched, I asked friends, I tested, I priced, I researched some more and I ended up with a Tassimo brewer from Bosch (a division of Kraft Foods). This coffee maker was reasonably priced and it did so much more than the competition. Expresso, cappuccino, latte, hot chocolate, tea – I could make it all with this little gem. I just knew I had made the best choice and my coffee wasting days were behind me. I was so satisfied with the product that I became the Tassimo poster child. I registered my system on the Tassimo Web site and gave Bosch my personal information (something I rarely do). I told all my K-Cupping friends about my state of the art coffee making mecca. I celebrated the Tassimo robot commercials on TV. Heck, I became a one man Tassimo advertisement. You could consider me the epitome of a loyal Tassimo customer. Unfortunately, over the past year or so I found that Tassimo coffees are getting harder and harder to find in retail outlets. Apparently Keurig made better agreements with coffee manufacturers like Starbucks than Kraft did and the availability of my dream coffee started waning. But I was not to be deterred, Tassimo had a Web site, right? So, I started ordering my coffee direct. This satisfied my need for awhile, at least until the choices became fewer and everything started being put on back order (especially my wife’s favorite, caramel macchiato). But I stuck with them – still believing in my choice of brewers. I mention this because I have put more into my Tassimo relationship than Bosch has. So, when I received the following email from Bosch telling me that they appreciated my business and were inviting me to a “Customer Appreciation Event”, I felt that they finally started recognizing my investment. 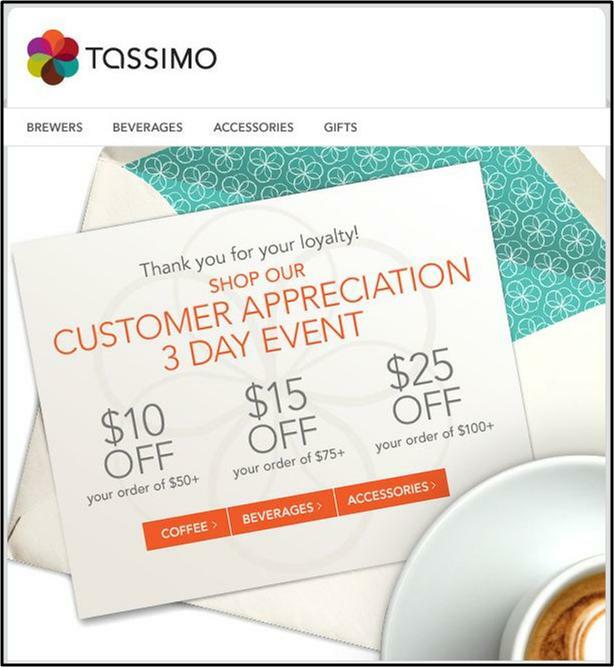 Based on the email, I could save $10, $15 or $25 – depending on how much additional loyalty I was willing to demonstrate . Apparently “loyalty” is measured by the number of dollars I am willing to spend now, not what I have already spent in the past. Nor is it measured by the fact that I have continued to stick with them even though half the time the items I want are on back order or that I continue to shop with them even though their merchandise has mysteriously disappeared from retail shelves. I didn’t respond right away, but the email did make me feel somewhat “special”. Apparently Bosch appreciated me, but only during the three days of the sales event, itself. Is that appreciation? Hardly. But, being the price conscious person that I am, I bit. I went to the web site and put in my order for over $100 dollars of merchandise to get the maximum discount (of which $75 worth of product was back ordered). Sigh…. Did Bosch consult their records of my buying history to help me make my purchase? Did they steer me towards those products that I have faithfully purchased in the past? Did they give me a whole-hearted apology for my products being on back order (for the umpteenth-millionth time)? Did they in any way make me feel “appreciated” in this transaction? Hardly. In fact, the whole experience has had the opposite effect. Instead of feeling appreciated, I feel like I was being used to help Bosch reach a sales quota. Unfortunately, the sales process has become a contentious relationship between the customer and the vendor. Customers are wary of being taken advantage of by vendors who are only out to sell (caveat emptor, right?). They feel that vendors are only out to take advantage of them, so they will do whatever they can to take advantage of the situation first. Unfortunately vendors who actually do care about their customers are all too often lumped into the same category as predatory ones (have you been to a used car lot lately). The trust between the customer and the vendor is all but gone. The fact of the matter is that it doesn’t have to be that way. Customers can be fiercely loyal to brands (just ask Apple, Levis, or Budweiser) and all that it takes is for the vendor to show an ounce of loyalty back. It doesn’t take much, just enough to make customers feel like they are valued. Just enough to make them feel like they have a say in the sales conversation, just enough to make them feel like they are truly ‘special’. A word of advice to vendors, ‘they don’t care how much you know until they know how much you care’. How much do you really care about us?